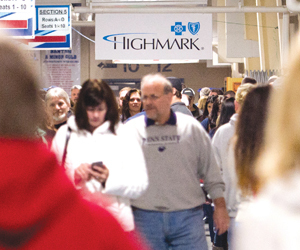 Take advantage of the heavy foot traffic throughout the concourse with a banner advertisement either along the arena walls or above the concourse walkways. Choose specific points of interest across the arena, such as the “Stats Board”, tracking league standings and team leaders for even better placement! 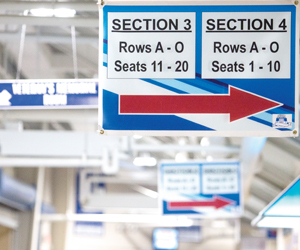 Help fans find their way to their seats and other points of interest across the arena with your logo on these signs, which hang throughout the War Memorial Concourse. Highlight the entrance to any seating section in the arena with your logo and advertisement hanging above the entrance or lining the walls opening up to the seating area. Or, sponsor one of the arena’s four main lobby entrances on Tomahawks game days with signage at the front door! Sponsor photo backdrop areas for media interviews or for fans to snap photos with Chopper, the team’s popular mascot.